I snuck a little whole wheat flour into my batch of biscuits, subbing 1/4 of the flour with whole wheat pastry flour. As far as whole wheat flours go, I have white whole wheat, whole wheat pastry, and spelt on hand and I like to use them where I can. With the cheese and bacon, no one will notice any difference! Preheat oven to 375 degrees, with a rack set in the middle position. Butter 10 cups of a standard muffin tin. In a large bowl, whisk together the flour(s), baking powder, and salt. Cut in the butter using a pastry cutter (or two butter knives) until you have a grainy mixture, with small and some larger lumps of butter visible in the mix. Add most of the cheese (reserving a small handful for topping), bacon, and the milk. Mix together with a rubber spatula. The dough will be wet. Spoon the dough into the 10 prepared muffin cups. Top each with a bit of the reserved cheese. Bake until golden and a toothpick inserted into the center comes out clean, about 25-30 minutes. Let cool on a wire rack before serving. I love that you're "getting reacquainted with bacon again." This is the perfect way to do so! And would be way more satisfying than the yogurt I'm eating right now! I think the crispy sides from the muffin tin makes these irresistible! All my favorite things in one hand-held muffin - what a great classic combination! They are so very pretty too. Good thing you're not my mom or I would really get into these "special requests". This recipe is a keeper! Hope the weather gets better - where's our snow? I totally agree on the crispy sides from using the muffin tin! I really liked that effect! Thanks, Tricia...and please, no snow! I've had enough from the last few winters to last a lifetime! Irresistible bacon biscuits. They look so tempting. I love the combination. Very easy to follow recipe. I will give them a try soon. Biscuits really are my downfall. Especially with cheese and bacon! I love good cheddar cheese (I never had it until I came to the US) and these biscuits sound SO good! I'd love to eat these with eggs and sausages just like how you served. What a great Sunday breakfast! I love weekend breakfasts and we make the most of it! So nice, no matter what we eat! I absolutely love that you added the scallions! You're totally right - bacon, cheddar and scallions are just so perfect together! These look delicious! The scallions, though mild, totally make a difference. Thanks, Ashley! I need them RIGHT NOW. Cheddar and bacon...this is a killer combination, Monica. These have my name written all over them! What a great combination! We seem to be eating a lot of bacon at the moment too (as the kids like it) so for me this is a great after-school-pre-dinner-savoury-snack for everyone. Thanks for sharing Monica! These biscuits look absolutely delicious! Oooh I'm such a bacon girl, and when paired with cheddar cheese, I'm so in. These biscuits sound and looks amazing - I could totally devour a few of these. Yes, pick up and go! Thanks, Lorraine. 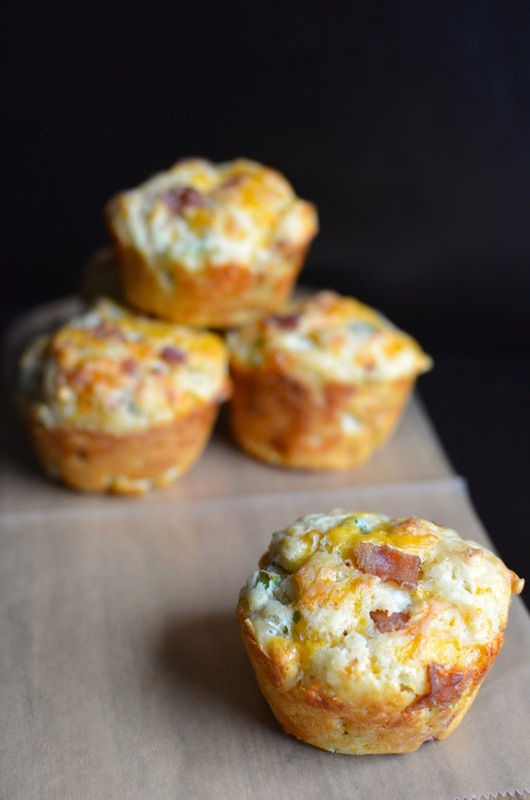 These biscuits look delicious, I love the combination of cheese, bacon and chive...I like the idea of using muffin cups. Thanks - hope all is well, Juliana. This is brilliant! Bacon and cheese...even saying those things make me happy. The scallions are a great addition too! I am going to make these soon..the twins are going to LOVE them! My little one certainly had no complaints. I also tried freezing a couple and reheating in a 300 degree oven and that worked well. Damn delicious to starting a day!!! I recently had some amazing cheddar bacon biscuits in a restaurant. They were super good! I said at then that I have to make some myself. Now, I have a recipe! Thanks, Monica. Will try this out in a week or two! Bryan will go crazy for these. These are super easy and they basically taste the way you would expect...I mean, cheddar and bacon, right! Hope you try it. Yum! IT's true; bacon makes everything taste better. It makes the world go round for us bacon-lovers, hehe (: I think scallions is a great addition as well! What a yummy recipe! I have 3 kids of my own and am always looking for novel ideas to pack for breakfast / snacks in school. Thanks for sharing this recipe. It's something I need to try NOW.